The Guild is delighted to announce a rental scheme, whereby members can rent equipment. What equipment is there for rent? 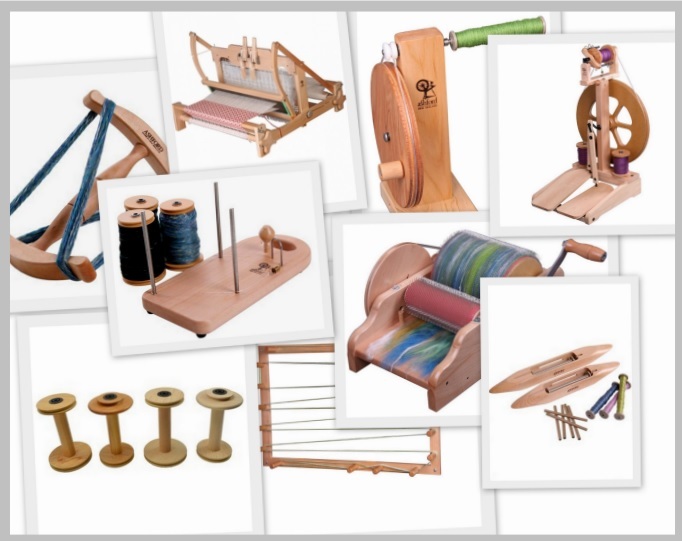 For weaving there is an Ashford 4 shaft 600mm table loom, which comes with a warping frame, and a raddle along with boat shuttle, bobbins and bobbin winder. There are also six Ashford Sample-It looms which can be rented individually or as a set. For spinning there is an Ashford Kiwi Double Treadle Wheel, or a Louet Victoria Wheel. Both wheels come with a Lazy Kate, and spare bobbins. There is also an Ashford Drum Carder (Fine 72 point, 2 speed, 20cm). Please note: The deposit and rental fees quoted do not include PayPal fees, which will be charged on top of the stated rates. How do I collect or return the item? Email rental@weavespindye.ie to arrange collection or transfer from the previous renter. Often rentals will be arranged to start and/or end at one of the Guild’s monthly meet ups or other guild events. The Eastern Region Guild Meet is the third Sunday of every month in Dublin City Centre. Payment is by Paypal only. You do not need to have a Paypal account to use Paypal, just a debit or credit card. Once you have emailed rental@weavespindye.ie to arrange renting, we will send you an email invoice, and you pay by clicking the button on that. We are a charity – can we borrow the equipment for teaching or demonstration purposes? The Guild is very happy to help raise money for charity, and the use of the items at public events also raises the profile of the crafts, which is one of our goals. Send us an email at rental@weavespindye.ie. Can I rent more than one item at a time? The wheel and drum carder may be rented together, otherwise it is not possible to rent more than one item at a time. Exceptions are made for events etc. Rental will be for one or two months, depending on demand. A waiting list will apply. Can I borrow equipment for longer than the time specified? Rental can be extended to three months, provided there is no waiting list for that item. I’m not a member – can I rent the equipment anyway? You must be a current member to avail of the scheme, if your membership for this year needs to be renewed the details are here. Membership is only €20 for the year. Any other queries, please email rental@weavespindye.ie.